This lovely tropical villa embraces the art of outdoor living, with all of its communal spaces open to the warm breeze and sound of the birds. 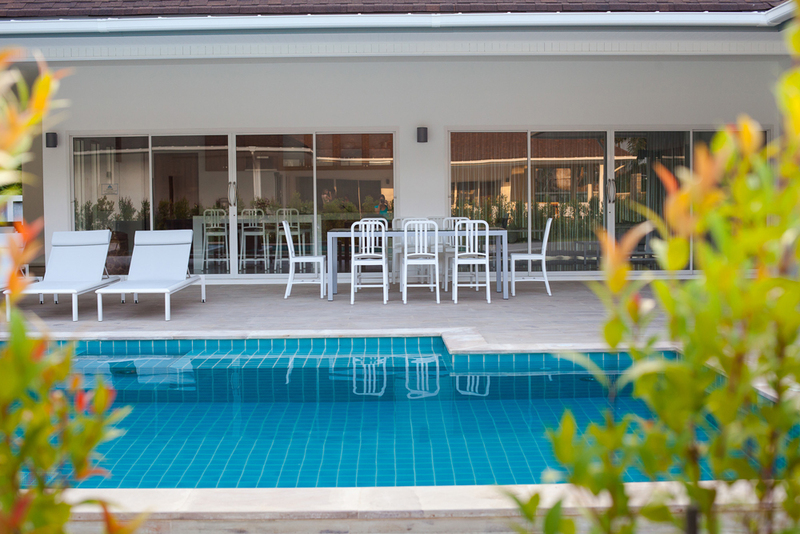 The focal point is the 8 x 4m turquoise-tiled swimming pool, with wooden sun deck, and all rooms are set around here. The main house offers a large open plan living space, that overlooks the garden and pool, with a 55” television and sofas; dining area to seat 6; and a galley kitchen with granite worktops, built in oven, 3 ring hob and a dishwasher. Wooden vaulted ceilings and fans keep the area shaded and cool. 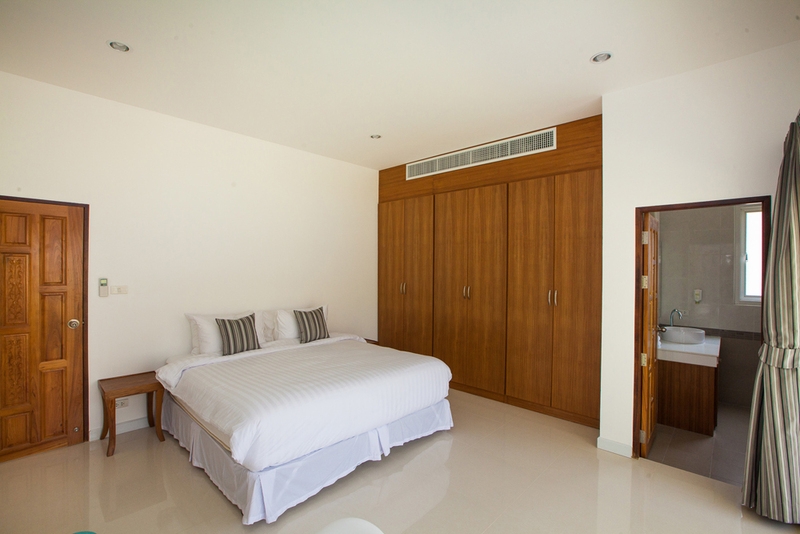 Two spacious king size bedrooms, each with ensuite bathroom, are located on either side of this living space. Both feature hardwood floors, walk-in wardrobes and French windows opening onto the garden. Both are also air-conditioned. 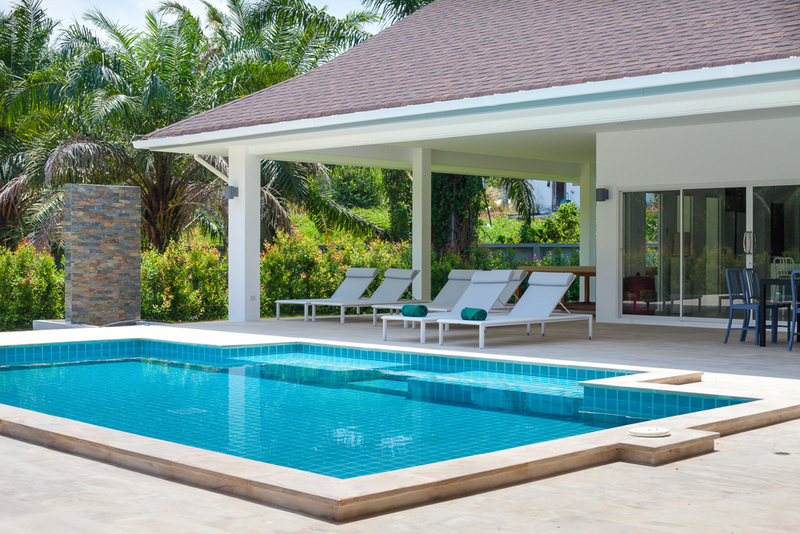 There is a separate pool house with open air shower, lounge and bar area, and a small indoor bathroom. This could be used both during the day and in the evening for playing games or listening to music. 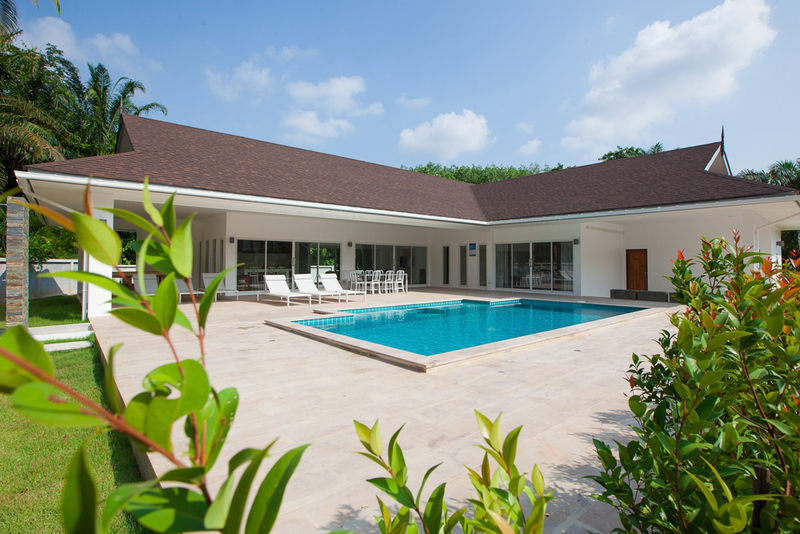 The abundance of warm wood, stone carvings and beautiful vases set against the mature tropical garden give Baan Rengron an authentic Asian appeal, but the villa is equally full of western amenities. It would be ideal for those seeking a Thai-style experience with a high level of comfort. 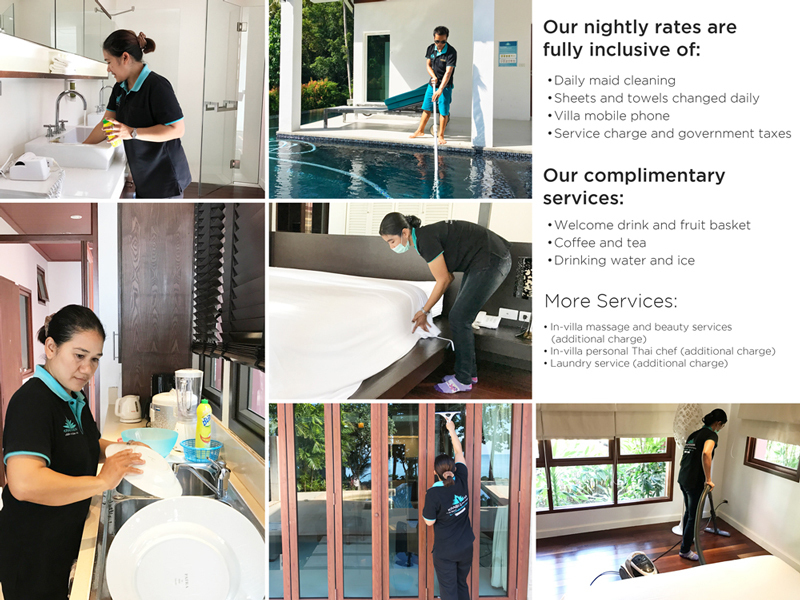 As with all Krabi Riviera villas, there is a daily cleaning service and concierge on call included in the basic rental price. Motorbike or car rental can be arranged (there is off-street parking available), or guests may avail the unlimited local tuk-tuk service, for a reasonable daily fee. Ao Nang Beach is located approximately 5km away. Sleeps 11 + 2 extra bed. The three-floor Thara Bay View Villa stands at the summit of a very steep hill, surrounded by a vast garden of terraced lawns and tropical foliage. Sleeps 11 + 2 extra bed. The three-floor Thara Bay View Villa stands at the summit of a very steep hill, surrounded by a vast garden of terraced lawns and tropical foliage. Perhaps befitting such a grand and imposing property, the house has a distinct James Bond feel to it: the décor is an eclectic mix of 1970s-style black marble floors and animal prints, with unusual wooden antiques and statues from northern Thailand. Best of all, the villa features a “secret room” accessed behind a wooden panel. The house is entered on the ground floor, through an antique pointed arch doorway, where a staircase leads straight up to the first floor bedrooms. The master suite is pure 007: a king-size four poster bed; large windows with panoramic views; and an ensuite bathroom with walk-in rain shower and double Jacuzzi featuring massage jets and integrated LED lighting. This bedroom – like the others – is air conditioned. It also has a large LCD TV and DVD player. Three other bedrooms – two king size and one twin – are also located on this floor, and share one bathroom. 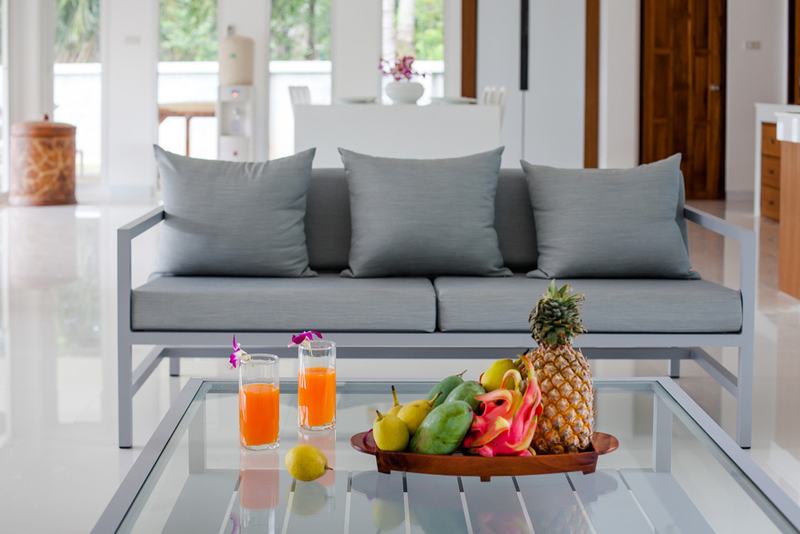 All feature rustic solid wood furniture from Chiang Mai. The second floor is entirely open, with a dramatic cathedral ceiling and full height windows along one wall. The space is divided into a kitchen corner, compact but well-equipped with its own breakfast island; a formal dining area; and a large living space with huge black leather sofas and LCD TV. 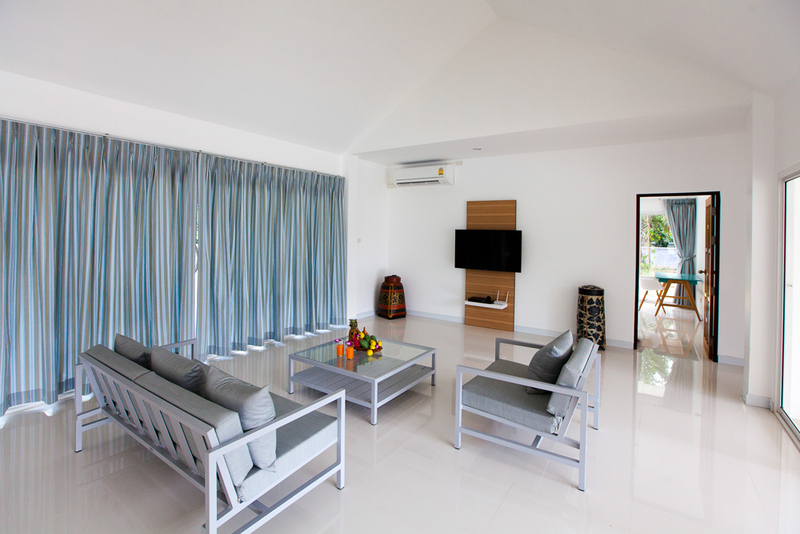 There is also a large breezy terrace with views across Noppharat Thara Bay and the islands beyond. Above the kitchen is a mezzanine, with double daybed and balcony, accessed by a spiral staircase. This is currently used as a library but could also function as an office or work space, or even as another bedroom for older children. The fifth, “secret” bedroom lies behind one of the wooden panels covering the walls on the second floor. Simply press in the right place and panel swings open, revealing a narrow staircase leading up to an attic bedroom, with plush red carpet and built in furniture. Back at ground level, the shaded garden terrace offers a sink counter and barbecue equipment, while to the side of the house, overlooking the countryside, sits a 10m x 4m swimming pool with surround deck and sun loungers. Wi-Fi internet is available in the house and pool area. Baan Rim Klong is located at the end of a quiet cul-de-sac in a gated compound, surrounded by tropical foliage, plantations and birdsong. 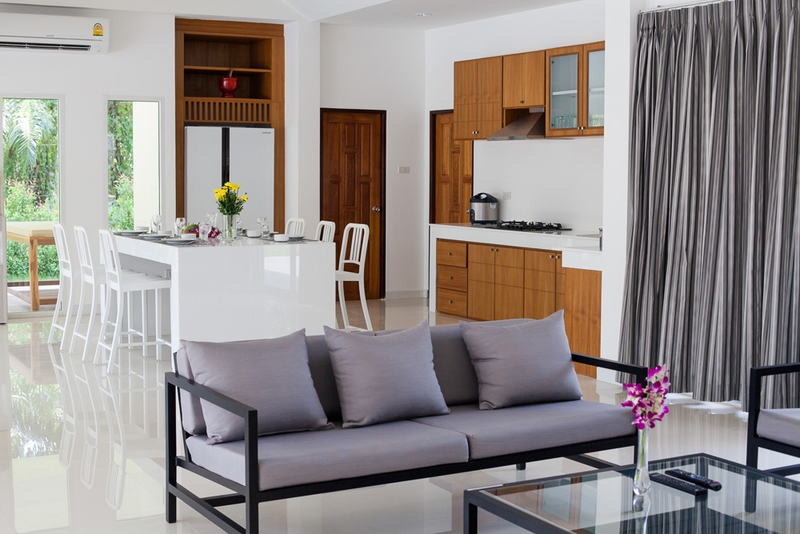 The peace and quiet are remarkable, given that it is less than five minutes drive to Ao Nang Beach. 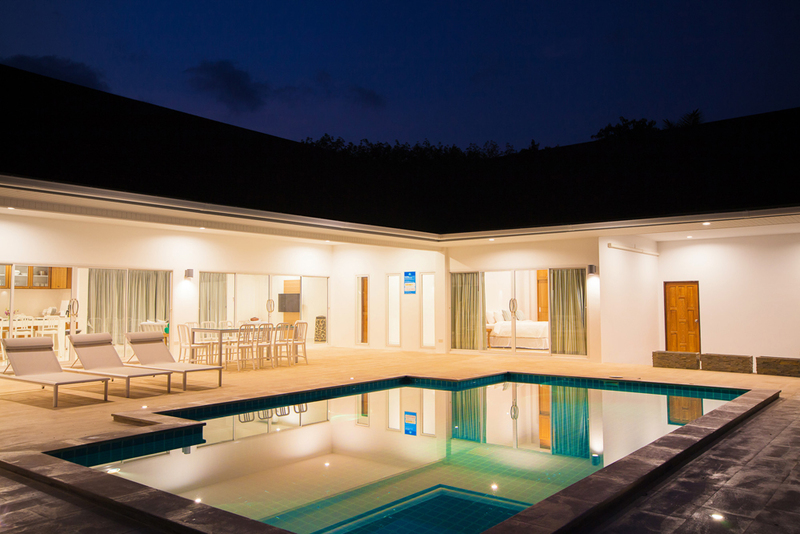 The layout is deceptively simple, following a classic L-shape plan, but there are several thoughtful design elements that transform the villa into an ideal vacation retreat. 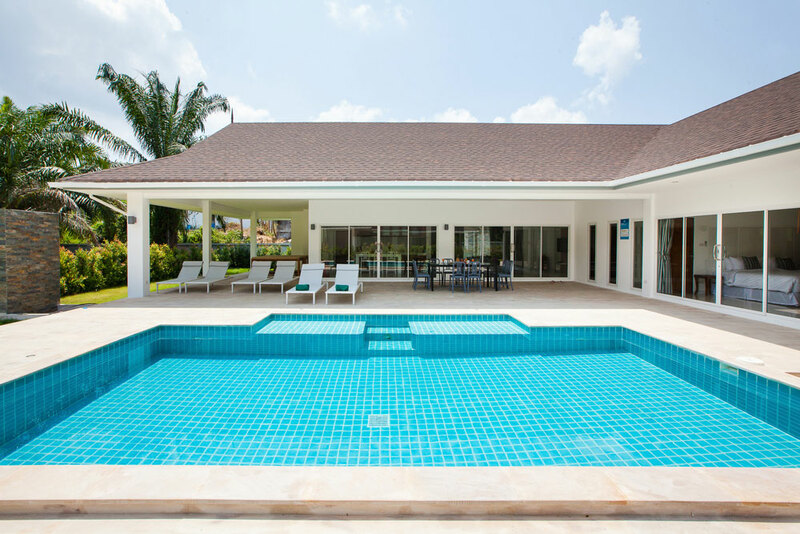 Firstly, the living and sleeping quarters are separated: two bedrooms, each with en-suite bathroom are located in one wing, and an open plan kitchen and living room in the other, connected by a tiled outdoor terrace. 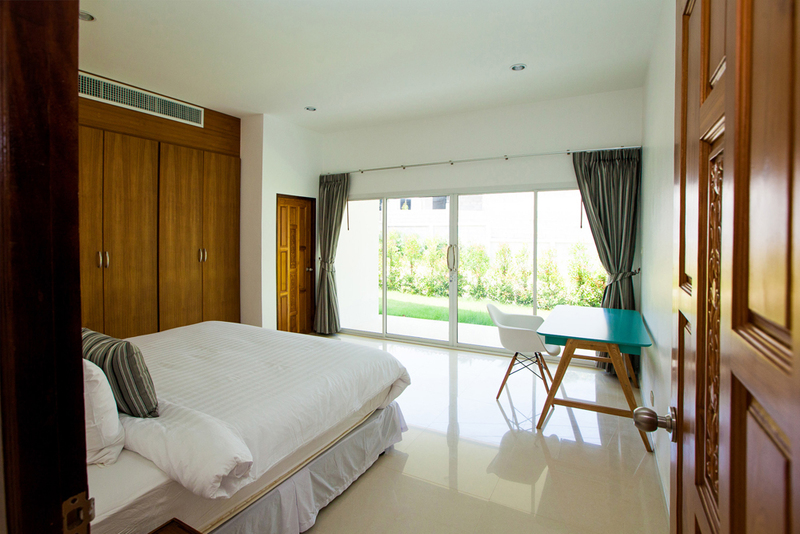 Each air conditioned bedroom has its own entrance from the verandah, allowing for complete privacy, and the separation from the living space means that both early and late sleepers and risers can be accommodated without disturbing others. The bedrooms are large, with one having twin beds, the other a king-size double bed. In both en-suite bathrooms, there are walk-in shower stalls with overhead rain shower, as well as separate dressing areas. 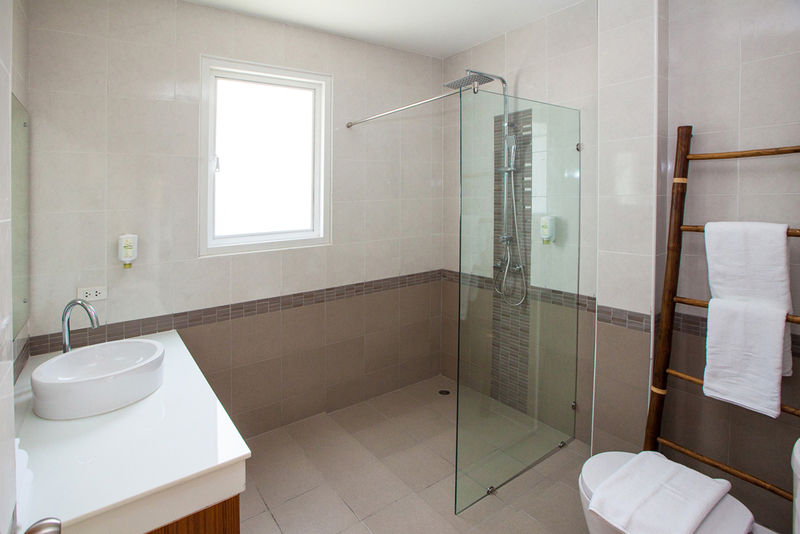 The bathroom in the twin bedroom is also accessible from the communal side of the house. 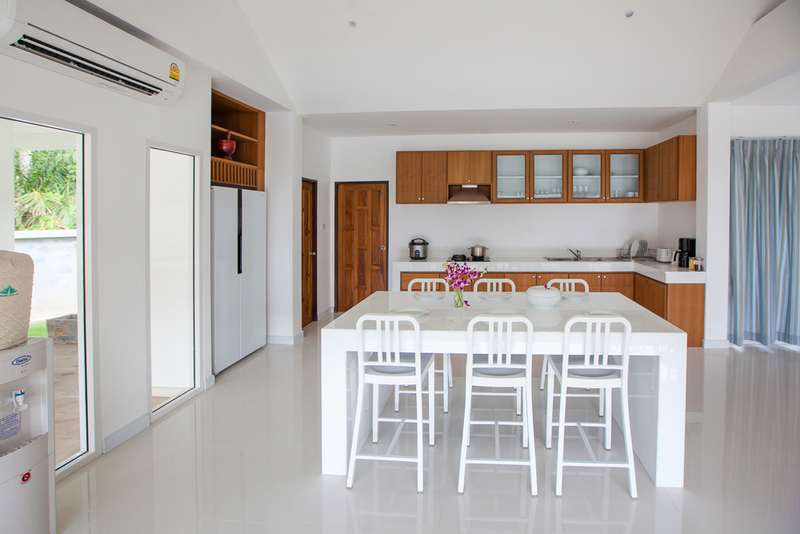 The kitchen-living room is fully air conditioned and, like the rest of the villa, features double height ceilings, which give a wonderful sense of space, as well as allowing air to circulate freely. Extra-wide granite counter-tops provide proper workspace for cooks, as well as room for a breakfast bar, seating 4 comfortably. At the rear, there is also a covered outdoor kitchen, perfect for barbecues, or Thai food prep (chef available on demand). The lounge area has a flat panel TV with satellite channels, and there is also complimentary wi-fi throughout the property. At the centre of the villa, and connecting the two wings, is a breezy, covered outdoor room, which is the focal point of the house. This multi-purpose space can be used for dining, relaxing, playing games and so on, year round, in all weather. Like the rest of the rooms, it looks out over, and has direct access to, the large garden. 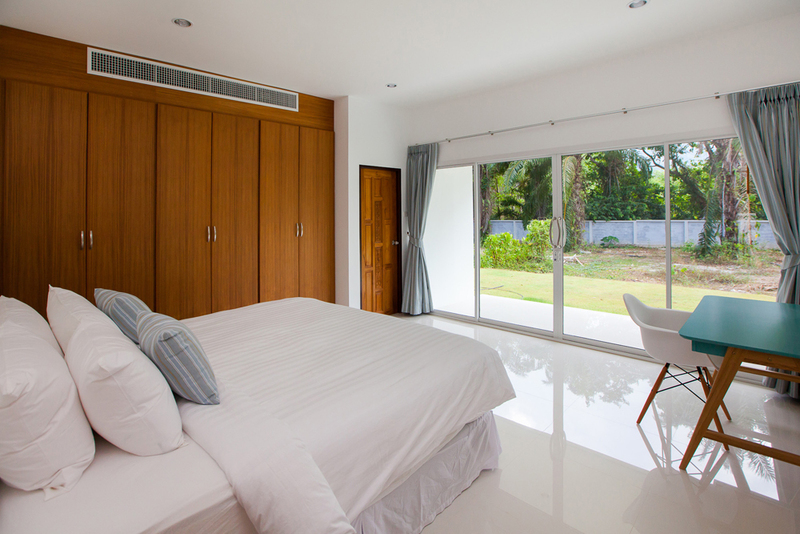 The décor in Baan Rim Klong is simple, European style with touches of Asia in the rice paper lamps and bright feature walls – orange in the living room, and purple and yellow in each of the bedrooms. Large picture windows and French doors maximize the light and create a feeling of outdoor living. 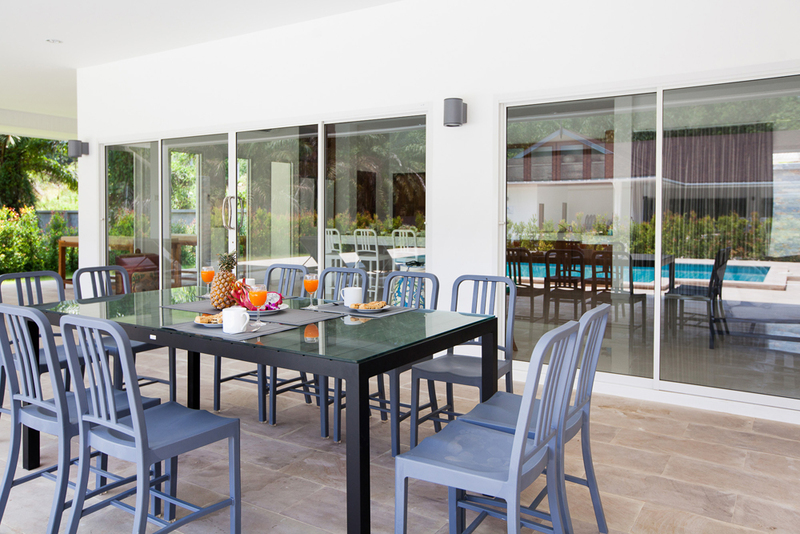 The villa is oriented to take advantage of natural cooling breezes, with much of the main house in the shade during the hot afternoon, while the garden and exterior deck receive the benefit of the sun. Please note that there is no private swimming pool on the property; guests may use the communal pool in the compound, some 150m away. Off street car parking is available; car or motorbike rental can be easily arranged. 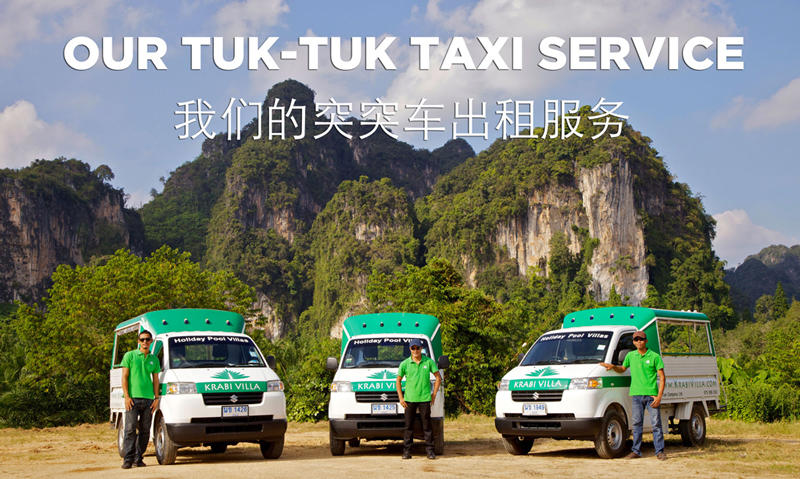 Those who do not have their own transport may use Krabi Riviera’s tuk-tuk service to get to and from the beach, and a personal concierge is also on call to arrange door-to-door sightseeing excursions. This stylish modern villa is situated in a large walled compound with one neighbouring property, Villa Anna, across the driveway (both villas may be rented together for large groups). The architecture maximises space and natural light, with a large central living space bordered by windows on three sides that opens the area up to the garden, and a huge column-less verandah and pool deck. 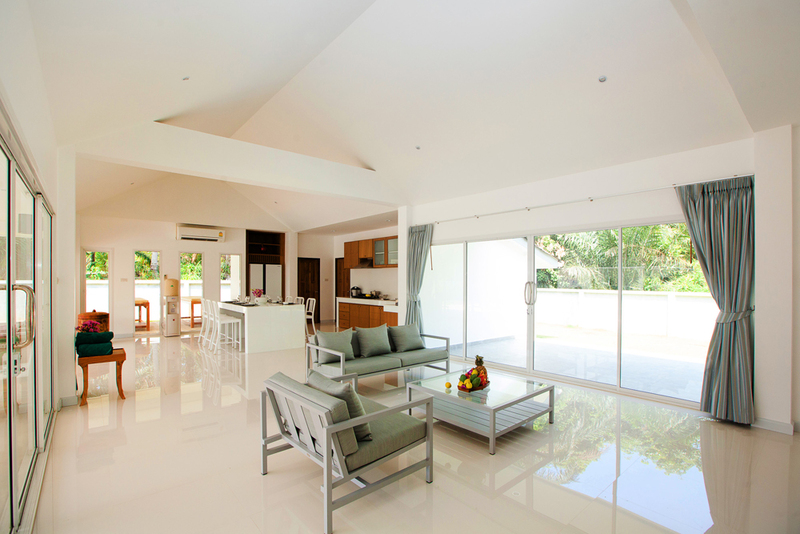 Vaulted ceilings and cool white marble tile add to the feeling of airiness. One side of the living area houses a lounge, with 48” screen smart TV; the other side has a dining space and kitchen, featuring built-in cabinets, a white marble island and standard appliances. The living space is served by a small powder room off the kitchen. 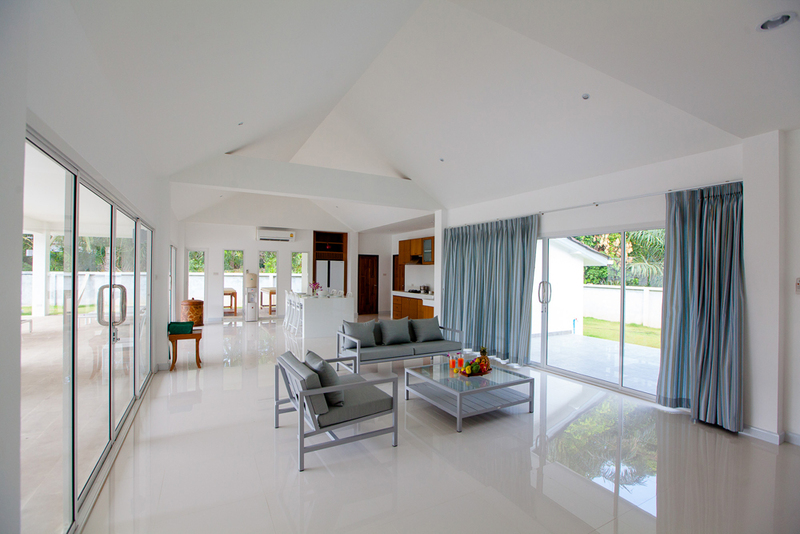 The layout of the villa is simple: all four bedrooms are accessed from this central space. One is behind the kitchen, a twin bedroom (two single beds); the other three (two with king-size beds, and one with queen-size bed) are located in a wing behind the lounge. All bedrooms are well-sized and offer built in wardrobes, air conditioning and ensuite bathrooms with hot water showers. 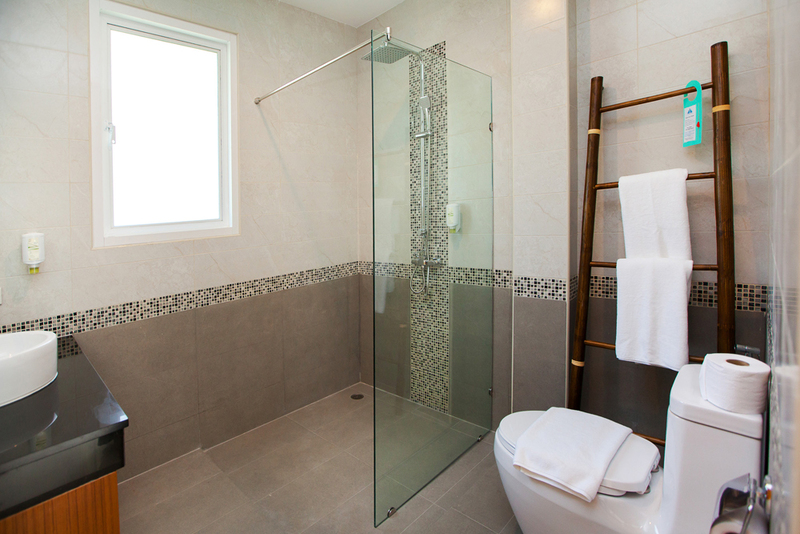 Bathrooms are large and tastefully appointed with neutral mosaic tile. The double bedrooms have garden access via patio doors. The master suite is the largest room of the four, and offers direct pool access, as well as a 40” flat screen TV. 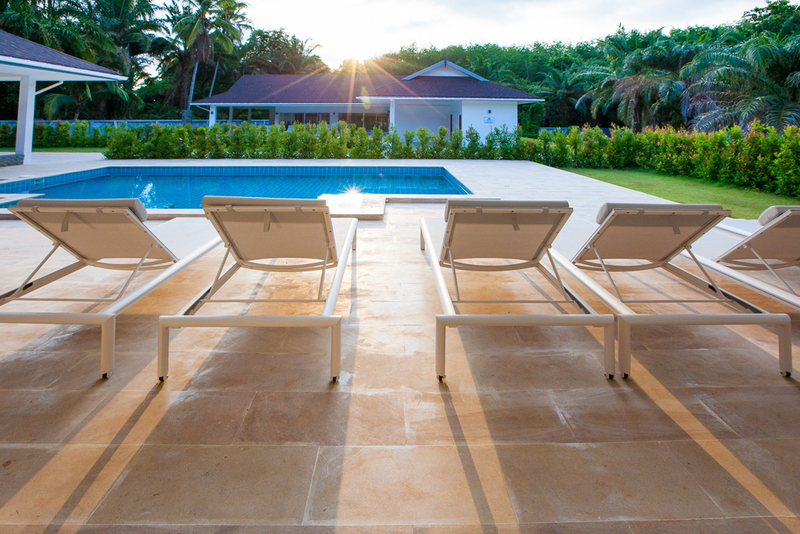 Outdoor space is plentiful at Villa Anna. 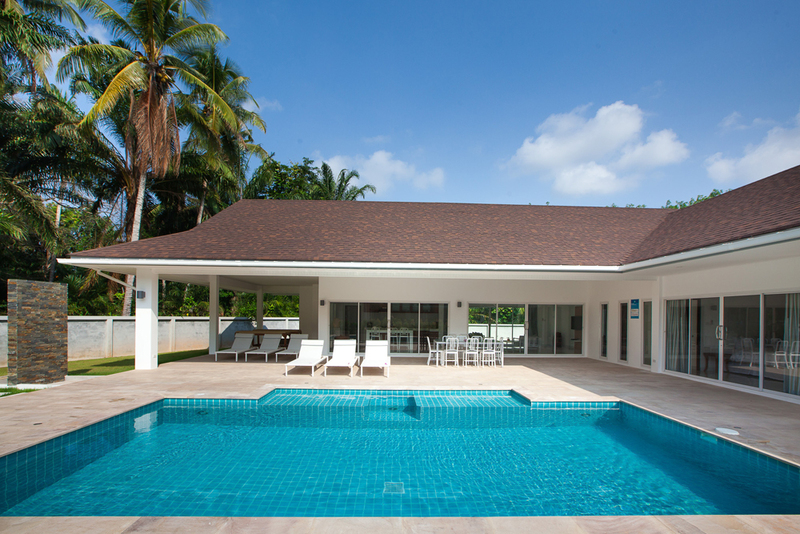 As well as a 8 x 4m private swimming pool, there is a large covered terrace, lawn and cooking area with Thai kitchen and BBQ. A car port allows for parking of 2 cars. This stylish modern villa is situated in a large walled compound with one neighbouring property, Villa Lalle, across the driveway (both villas may be rented together for large groups).